This is the Fiat 500X, a new compact crossover from the Italian marque, which was unveiled at the Paris Motor Show yesterday. The new model completes a range of cars based around Fiat's popular 500 supermini, joining the 500 hatchback, 500C convertible and the 500L people carrier, which is available in standard and off-road 'Trekking' guises. Like the 500L, the 500X crossover will be offered as two distinct models. The first is pitched as a stylish car for city-dwellers, while the other is more rugged, and aimed at people who use their car for mild off-roading, or "active, stylish adventurers", according to Fiat. It also shares the 500's cutesy retro styling, though because of its larger size doesn't appear anywhere near as chic. There are four petrol and three diesel engines to choose from. Customers looking for an efficient front-wheel-drive model will get the option of 108bhp 1.6-litre or 138bhp 1.4-litre turbocharged petrol motors, and 94hbhp 1.3-litre and 118bhp 1.6-litre turbodiesels. Four-wheel-drive models get slightly more power, with a 168bhp turbocharged 1.4 petrol and 138bhp 2.0-litre diesel offered. Front-wheel-drive models are mated to a five- or six-speed manual gearbox, depending on engine, with a six-speed twin-clutch automatic available as an option. 4x4 petrol models get a nine-speed automatic gearbox (a first in a Fiat car) as standard. The 500X has a 'Drive Mode Selector' allowing drivers to select different operating modes for the engine, brakes, transmission and steering. Default 'Auto' mode is geared towards efficiency, 'Sport' increases throttle sensitivity and steering weight for a more dynamic feel, and 'All Weather' adjusts settings to maximise grip in slippery conditions. As well as the usual plethora of personalisation options, the 500X includes Fiat's Uconnect infotainment system, which is driven through a 5.0-inch colour touchscreen. Its features include Bluetooth and USB connectivity, as well as smartphone integration. 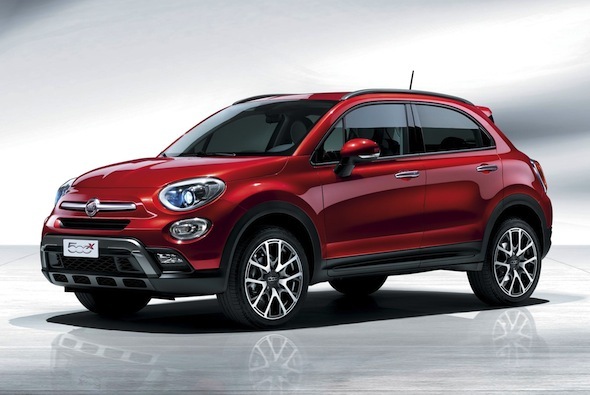 Full price and specification details for the Fiat 500X will be revealed closer to its UK showroom debut in the second quarter of 2015.